Burn the Floor has been wowing audiences since 1999 and has played to packed out theatres across the globe. The show describes itself as “The Ultimate Ballroom Sensation” and is a modern fusion of Ballroom and Latin American. 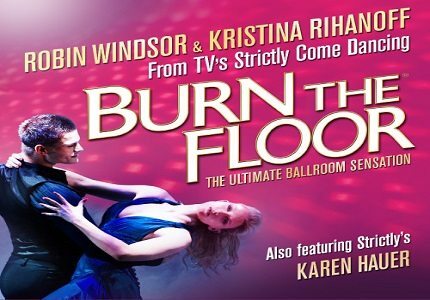 Burn the Floor is directed by the famous Australian Ballroom Dance champion, Jason Gilkison and features a number of professional dancers from the UK television series Strictly Come Dancing including Robin Windsor, Kristina Rihanioff and Karen Hauer. The stars are joined by 15 other world class dancers who join them to dance the evening away in true Strictly style. Burn the Floor is split into 10 dances from eras ranging from the 1800’s to the modern day, including peppy 1920’s styles 50’s hand jives and modern day Latino Styles. The dances demonstrated are the Waltz, Foxtrot, Viennese Waltz, Tango, Quickstep, Cha Cha, Samba, Paso Doble, Rumba and the Jive, terms which will be familiar to fans of dance. Each performance is set to wow the audience with its powerful rhythm and flawless choreography. Furthermore dances are performed to music from a live band and two singers, completing the total experience of live entertainment. Fans of BBC’s Strictly Come Dancing will absolutely love this show, which is essentially a lot like being in the studio audience for an episode of the show! Fans of Ballroom dancing will love the tender moments of the show and fans of the trendy Latino style will be drawn in by the sensual wiggling of hips! Burn the Floor is a family friendly show and children are more than welcome to come and enjoy the action. Children with an interest in dance will especially love this show, and it is a good demonstration of several forms of dance. Please note that children under the age of 4 are not permitted inside the auditorium of the Shaftesbury Theatre. Click here for the Shaftesbury Theatre seating chart and seat price guide.